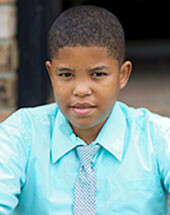 Aaron is a playful, free spirited twelve year old who loves engaging with others. He loves being on the go, playing outdoors, riding his bike, and playing basketball. Like most boys his age, Aaron enjoys playing on his electronic tablet device and playing video games. Aaron enjoys school for the social fulfillment, but sometimes need a little extra help in completing school and homework assignments. However, his eagerness to learn is sure to encourage his new family to want to help him succeed academically. If your family believes it has the tenacity, and commitment to make this handsome pre-teen the newest member of your family, please inquire today!